One day, I promise to stop banging on about the marvels of HDR (also known as high dynamic range) and why you should really start thinking about upgrading your PC monitor in order to take advantage of its vibrant, life-like colours, increased brightness and general loveliness. Until then, however, I’ve got BenQ’s EW277HDR monitor to have a gander at, which might just be the best gaming monitor for HDR on the cheap I’ve seen so far.Priced at just £166 / $230, the BenQ EW277HDR is very much at the other end of the HDR monitor spectrum, especially compared to something like Nvidia’s all-singing, all-dancing G-Sync HDR displays such as the soon-to-be-released Asus ROG Swift PG27UQ and Acer Predator X27. These $1000-2000 monitors are all about getting the very best out of everything HDR has to offer, namely its incredible brightness range, with both panels able to reach a massive 1000cd/m2, and its wide colour gamut support. 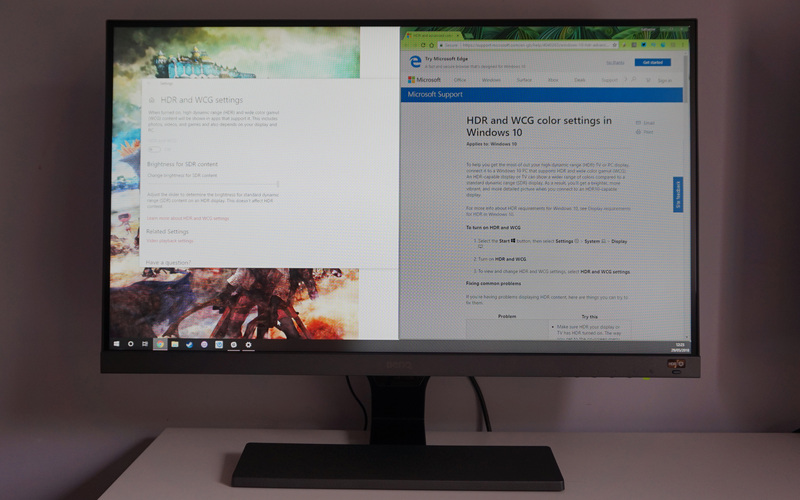 In essence, they’re the monitor equivalent of today’s Ultra HD Premium TVs. The EW277HDR, on the other hand, has far more modest ambitions. With a claimed max brightness of just 400cd/m2, this isn’t a monitor that’s going to blow you away with its astonishing contrast, localised highlights and simultaneous deep, inky blacks. But that’s all right, to be honest. Firstly, you’re paying about a tenth of what the Asus PG27UQ is currently rumoured to cost, so to expect anything more would be churlish. Secondly, this is still a damn good-looking monitor and a heck of a lot brighter than most of the other non-HDR monitors you tend to see at this kind of price. Indeed, the EW277HDR’s main strength comes from doing the colour gamut bit of HDR really well, putting it way out in front of other sub-£200 monitors that don’t support HDR. In fact, BenQ say the EW277HDR’s DCI-P3 colour gamut coverage goes beyond that of high-end TVs – 93%, to be precise, compared to an Ultra HD Premium TV’s required 90% – giving you the same rich, punchy colours as one of those Nvidia G-Sync HDR screens without forcing you to spend an absolute fortune on a flashier panel. The EW277HDR’s dedicated HDR button can be used to emulate HDR for non-HDR content. This bore out in testing, too, even when HDR wasn’t enabled. Using the EW277HDR’s Standard colour profile and the Reddish colour temperature setting, my X-Rite Display i1 Pro calibrator showed it can display an impressive 99.8% of the standard sRGB colour gamut and 91.9% of the DCI-P3 gamut when set to maximum brightness (which measured about 340cd/m2 according to my i1 Pro). I saw pretty much identical results when I switched to its User profile and started adjusting its individual RGB values as well, so you don’t even have to spend ages fiddling around with the settings to get the best picture. Even better, the EW277HDR maintained these figures when I dropped the brightness down to a much more eye-friendly 200cd/m2 (around 50% on the brightness slider), so you can still get a good-looking image while saving your eyeballs. The monitor’s black levels were decent as well, coming in at 0.11cd/m2 regardless of colour profile. Its VA panel also put in a good performance over in the contrast ratio department as well, coming in at 2877:1 when using Standard and 3102:1 on User. That’s pretty much bang on BenQ’s claimed 3000:1, give or take a bit. All that’s pretty outstanding for a monitor that costs less than £200 / $250, and it means you don’t have to have HDR enabled to get the best picture, either. Regular SDR (or standard dynamic content) will look just as good without it, although you can always use the monitor’s dedicated HDR button to help ’emulate’ the effect of HDR on SDR content if you don’t fancy faffing around with the settings in Windows 10. Admittedly, Windows 10’s rather patchy support for desktop-based HDR makes it difficult for me to run my tests with HDR switched on (even with the improvements included in the latest April update), so you’ll have to take my word for it that colours still look pretty great when playing HDR-supported games such as Final Fantasy XV and Far Cry 5. Indeed, when I plonked my calibrator onto a nice sun flare in Far Cry 5, I measured a peak white level of 410cd/m2, going just beyond what BenQ quote on the box. That’s a decent jump from what you’d get without HDR turned on, but as I hinted above, the overall effect isn’t absolutely mind-blowing, and probably isn’t much of a step up from what you’ve got now – at least not compared to Nvidia’s G-Sync HDR monitor with their 384 dynamic backlight zones that really let highlights sing out against darker areas of the screen. There’s also a noticeable amount of halo-ing going on at certain points with the EW277HDR, particularly when you’ve got white text on a dark background. This can sometimes spoil the effect of the monitor’s increased brightness, but on the whole it’s something I’m more than happy to put up with considering the price. That said, there are other drawbacks to the EW277HDR that I’m less keen to let slide, namely its 1920×1080 resolution. Normally, I wouldn’t recommend going for 1080p on a 27in monitor, as the pixel density on a screen of this size starts to look a bit small when you’ve only got 1920×1080 pixels to play with, resulting in jagged edges in text and desktop icons. It’s fine for the most part, but everything is just fuzzy enough to make you second guess whether you need another trip to the opticians. Personally, I would normally recommend a 2560×1440 resolution on a 27in monitor, but then you’re looking at paying a lot more for the privilege. 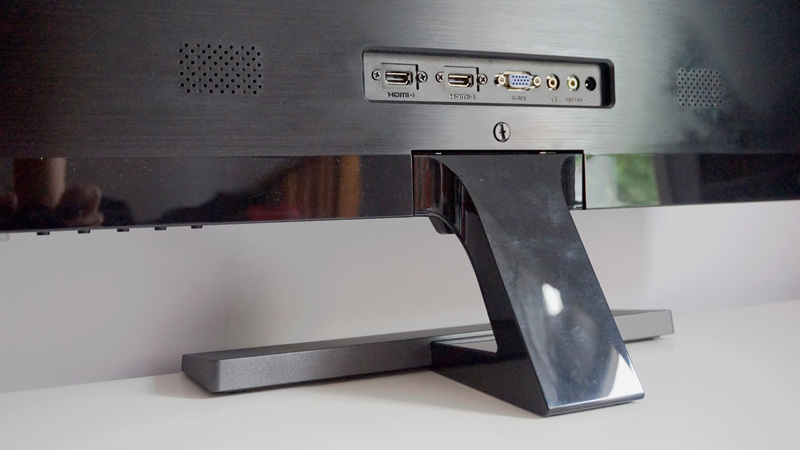 As 27in 1080p monitors go, though, it’s certainly a lot more attractive than my current top recommendation in this category, the Philips 273V5LHAB. With its slim bezels and smart (albeit fixed) stand, the EW277HDR is the clear winner in terms of design, and BenQ’s multitude of eye-care features make it, quite literally, a lot easier on the eyes when it comes to extended use. You not only get four different blue-light filters and a flicker-free panel, but you also get the benefit of BenQ’s Brightness Intelligence+ sensor that automatically adjusts the screen’s ambient brightness and colour temperature throughout the day to help reduce eye strain as much as possible. Enabling these modes will naturally result in a slight hit to the monitor’s colour accuracy, but you’ll probably thank yourself in twenty years time when your eyes are no longer staring out of shriveled husks like everyone else. Ports-wise, I would have liked to have seen a DisplayPort here, but alas, all you get are two HDMI 2.0 inputs and a single VGA, plus separate headphone and audio line in jacks. That’s still perfectly acceptable, of course, and more than enough to cater for the EW277HDR’s resolution and 60Hz refresh rate, but a little more variety wouldn’t have hurt. 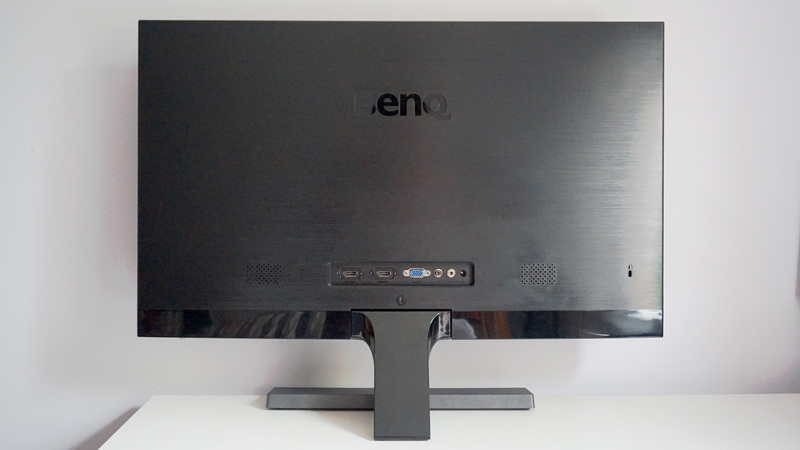 Minor flaws aside, the BenQ EW277HDR is a fantastic monitor for the money, and it’s definitely worth considering if you’re looking for a decent-sized screen with outstanding picture quality that doesn’t cost the earth. It’s definitely the best 27in 1080p monitor I’ve seen so far thanks to its superb colour accuracy across both the sRGB and DCI-P3 gamuts, and as such supplants the Philips 273V5LHAB as my top recommendation for this particular spec. Its HDR is also miles better than BenQ’s more expensive EL2870U, but I must close with a word of warning that those after a ‘proper’ HDR experience, complete with all those lovely eye-searing highlights and simultaneous patches of shadow, will likely still be disappointed with the EW277HDR due to its comparatively low peak brightness. Yes, lumping budget screens like the EW277HDR in the same ‘HDR’ bracket as the Nvidia G-Sync HDR-enabled Acer Predator X27 and Asus PG27UQ is only likely to get more confusing in the coming months as every monitor man and his dog starts to cash in on PC gaming’s latest buzzword. As long as you don’t go in expecting a cosmic shift in overall impact, though, then the EW277HDR is by far one of the better places to start looking for a boost in colour accuracy, and is definitely a much better use of your money than the EL2870U. It comes highly recommended. Tagged with BenQ, feature, Hardware, HDR, Monitors.